Most sperm whales live in family groups, which tend to aggregate into larger clans and communicate with each other through “clicks.” Each clan has a unique click dialect, but whales from different clans sometimes inhabit the same waters—and without physical barriers, scientists were unsure how these vocal patterns remained distinct. According to a study published in Nature Communications last month (September 8), young whales learn their dialect from surrounding clan members. 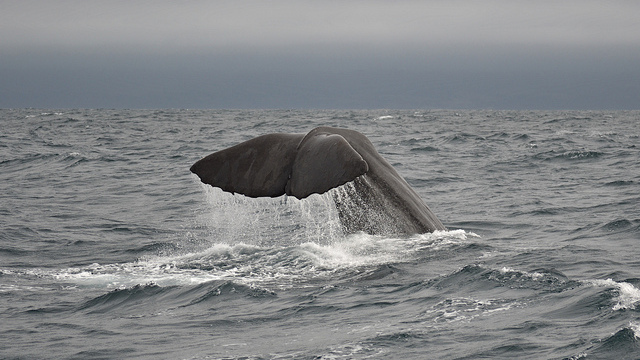 An international group led by Mauricio Cantor, a marine biologist at Dalhousie University in Canada, analyzed an 18-year behavioral dataset from sperm whales near the Galápagos Islands. By modeling hypothetical scenarios, the researchers concluded that the most likely explanation for the different dialects is that whales learn vocalization patterns from similar neighbors. “It’s what we call biased social learning,” Cantor told The Christian Science Monitor. “They tend to learn the most common sounds, like conforming to a fashion.” The model provides evidence for a cultural learning system in sperm whales, rather than click dialects driven by genetic inheritance. Migrating birds require a lot of calories during their journey, but they have to balance obtaining food with safety. A desperate songbird might stop to refuel in a dangerous location and turn into a lucky hawk’s dinner. 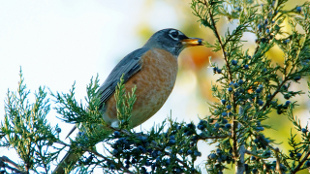 Last month (September 30) in The Auk: Ornithological Advances, researchers reported that migrating birds prefer to stop in areas with dense vegetation where they can hide, but will take more risks in search of a meal if they have a longer migration. Jennifer McCabe and Brian Olsen of the University of Maine monitored six sites along Maine’s coast through two fall migrations. While some of the study sites allowed birds to eat safely, usually in brushy forest edges, others required the animals to venture out into the open for the best resources. McCabe and Olsen mist-netted 9,649 birds from 28 different fruit-eating species, finding that more birds foraged in the safer areas. However, compared to the shorter-distance migrants, longer-distance migrants frequently visited patches with more food regardless of safety. “The neatest aspect of the study was that we used the entire migratory community to look at tradeoffs between foraging and predator avoidance similarly to behavioral research on single species, and we found similar results at the community scale as single species studies did,” said McCabe in a press release. Electric eels use their natural voltage not only as a weapon to paralyze prey, but also as a high-precision tracking device once their target is stunned, Kenneth Catania of Vanderbilt University in Tennessee reported in a Nature Communications study this week (October 20). 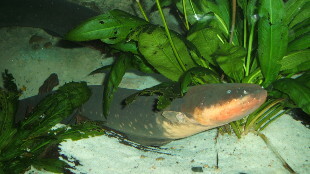 The eel uses feedback from its electrical pulse, conducted through the prey’s body, to home in on the target location. The phenomenon had gone previously undocumented largely due to the eel’s attack speed. “It required slow-motion video to really capture this,” Catania told The Washington Post. Milliseconds after stunning its prey, the eel is already moving to catch it; Catania had to observe the animal’s behavior during this short window. He tested a variety of scenarios to pin down the electro-location ability. When he insulated the fish from the eel’s electric feedback, the eel had trouble finding them. Further, when Catania added a conductive carbon rod to the tank, the eel always lunged towards the rod, confusing it for the fish. “That electric eels are electrolocating prey as they stun them is at once astonishing and intriguing,” Aaron Corcoran, a sonar expert at Wake Forest University in North Carolina who was not involved in the research, told National Geographic. Arranged marriages aren’t really for the birds—at least not zebra finches. These birds partner for life, and individual mate choice is important to their reproductive success, according to researchers from the Max Planck Institute for Ornithology in Germany who published an analysis of this behavior in PLOS Biology last month (September 14). No single quality, like size or plumage brightness, has been linked to mate choice for zebra finches, according to the authors. In a study group of 160 zebra finches, groups of 20 females were freely allowed to choose mates from 20 males. Half of the happy couples were allowed to stay together, but the researchers divided the other half, pairing them with different birds and tracking their reproductive success. “The separated females must have assumed that their mates had died, and they gave in and bred with the guys that we assigned,” study coauthor Malika Ihle of the Max Planck Institute told Science. 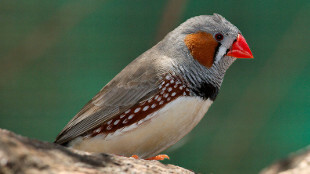 The team observed that the zebra finches who chose their own mates were more successful. Their nests had more fertilized eggs, and the hatched nestlings had an average 37 percent higher survival rate, indicating better parental care behaviors in chosen pairings. Males that were forcibly paired were less invested in caring for their offspring and less loyal to their mates, the researchers found. The study “suggests that having a mate you’re behaviorally compatible with is very important from an evolutionary perspective for zebra finches,” behavioral ecologist Sasha Dall of the University of Exeter, U.K., who was not involved in the study, told Science. Previously thought to spend most of their days in silence, giraffes “hum” to one another at night, according to researchers who recently recorded the animals. The vocalizations reportedly sound like a low-pitched cow’s “moos.” Researchers from the University of Vienna discovered these sounds when analyzing 947 hours of overnight giraffe audio from three European zoos; their results were published last month (September 9) in BMC Research Notes. “Even giraffe keepers and zoo managers stated that they have never heard these vocalizations before,” the researchers wrote in their report. 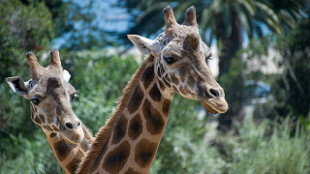 Initially, they were testing whether giraffes were using infrasound to communicate below the range of human hearing. At 92 Hz, the hums weren’t quite low enough to count as infrasound. “I was fascinated, because these signals have a very interesting sound and have a complex acoustic structure,” study coauthor Angela Stoger told New Scientist. It’s not clear why giraffes might hum, but scientists have speculated a few options. “It could be passively produced—like snoring—or produced during a dream-like state—like humans talking or dogs barking in their sleep,” Meredith Bradshaw, an animal behavior researcher from Franklin & Marshall College in Pennsylvania who was not involved in the study, told New Scientist. Bradshaw added that it could also be a way for giraffes to communicate with one another in the dark, when their vision is limited.